Childhood is the best time to present a relevant and engaging Gospel message. Our desire is that no child would slip past the age of 14 without a valid opportunity to encounter Jesus. Over one-fourth of the world’s population is under the age of 15. Unfortunately, when thinking about missions and spreading the Gospel, children are often overlooked or not taken seriously. Yet, those who exhibit the greatest faith, more than at any other time in their lives, are children. 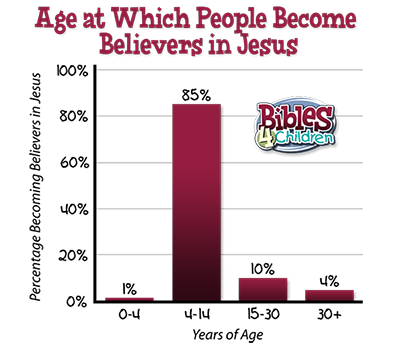 Children between the ages of 4 and 14 are the most receptive to the Gospel than any other age group. Some have called this the “4/14 Window.” Over 85% of those who receive Jesus as their Savior, do so during this 10-year span. These are also the years when every person develops his or her lifelong impressions of God. In the places where Bibles-4-Children is engaged, the illiteracy rate can be as high as 75%. However, those who do have the ability to read are often the children. It is not unusual to see children reading the Bible and Bible storybooks to their parents, family members and friends. * These are conservative estimates. Our experience shows a much higher impact and response to the Word of God. Jesus even highlighted the fact that everyone, whether young or old, must come to Him in child-like faith.